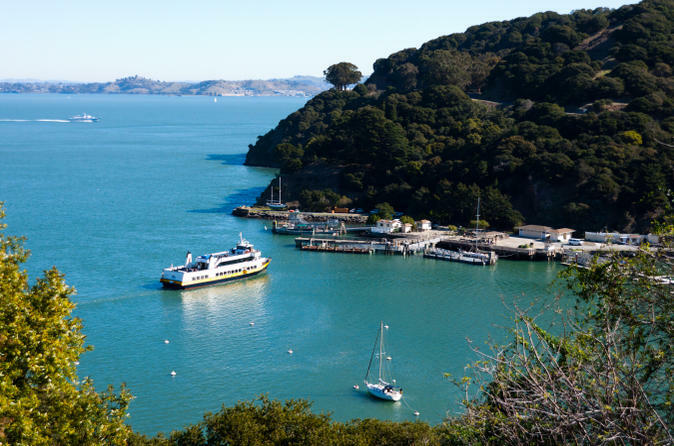 Hop aboard the San Francisco ferry for a trip to Angel Island. This one-way or round-trip ferry service takes you across San Francisco Bay with beautiful views of the Bay Bridge, Golden Gate Bridge and Alcatraz. On Angel Island, enjoy a variety of recreational activities on your own and capture unbeatable vistas of the San Francisco skyline, Marin County Headlands and Mt Tamalpais. This is the most convenient way to get to Angel Island, and makes for a great day trip with family and friends. From Fisherman’s Wharf, board the morning ferry and relax on the ride on San Francisco Bay to Angel Island. Along the way, enjoy views of the Bay Bridge, Alcatraz and the iconic Golden Gate Bridge. This comfortable vessel features several amenities for your comfort and convenience, and drinks and snacks are available for purchase on board. When you arrive on Angel Island – a state park and wildlife reserve – you’ll be treated to some of the best views of the surrounding Bay Area: the stunning San Francisco skyline, the Golden Gate Bridge, the Marin County Headlands, Mt Tamalpais and, on a clear day, even Sonoma and Napa from the north side of the island and San Jose from the south side. Angel Island offers great hiking trails and a variety of recreational activities suitable for the whole family. At your own leisure and expense, hop on an electric scooter, Segway or tram for a scenic ride, or rent a bike for more adventurous exploration. You can also learn about the island’s fascinating military history. Enjoy some fresh oysters (own expense) from the island’s restaurant before hopping back on the ferry to return to San Francisco.